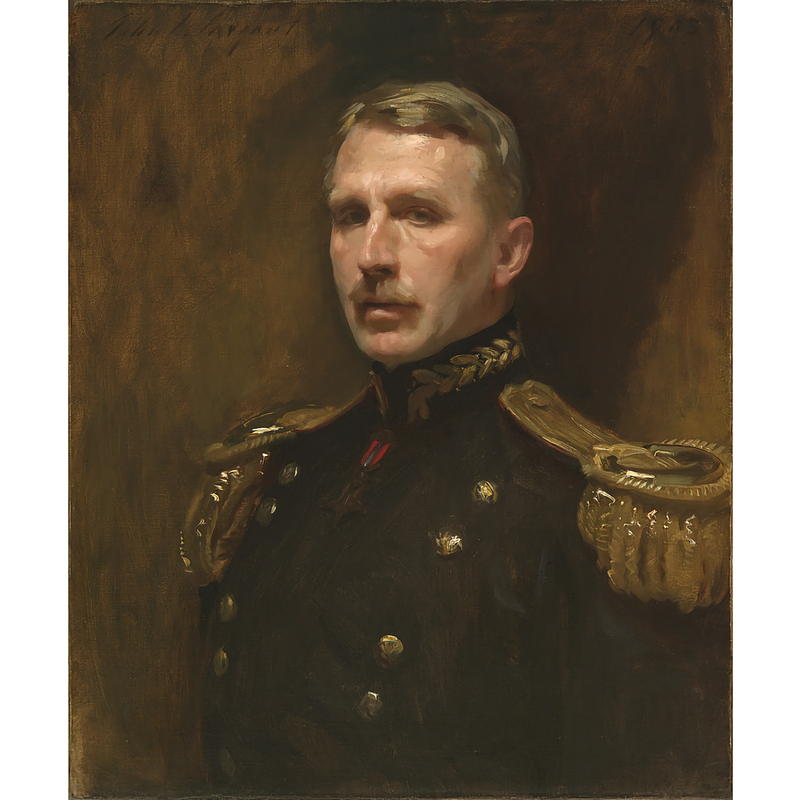 John Singer Sargent was such an acclaimed portrait artist that, theoretically, he could’ve had the choice of any military figure to represent—but it seems that he actively sought out General Leonard Wood in order to paint him. Allegedly, Sargent “admired” Wood; hopefully this admiration was based more on his personality or appearance, and less so on his actions as a force for American imperialism in Cuba and the Philippines. Wood was born in 1860 in New Hampshire and, at the urging of his family, pursued a medical career that quickly turned into a successful position as a military surgeon. In 1898, he was accomplished enough that he was the personal physician to President William McKinley. He also became close friends with future president Teddy Roosevelt. At the end of the Spanish-American war (which he fought in), Wood was given a commanding position in the occupying American army in Cuba as the governor of Santiago province, a position that opened after the prior governor got drunk and undertook a catastrophically public six-day rager through the city. Wood quickly rose to become military governor of the whole island, thanks to his political connections, and under his command, the Cuban occupation became “progressive” (as progressive as is possible for nineteenth-century colonialism). He spearheaded many projects to combat the famine and epidemics of yellow fever and smallpox that the war and prior Spanish occupation had caused or exacerbated. He also worked to rebuild infrastructure and help to establish a Cuban democracy to govern the nation after Spanish and American occupation. This “progressive” imperialism was nowhere to be found in his later governing of the Philippines. As the governor of Moro province, Wood was met with resistance by indigenous Filipino Muslims, who had suffered under Spanish colonial rule and were not in the mood for the same system with a different government behind it. Wood’s own actions did not help the tension—he disrespected the local leaders and saw their rebellion against his idea of “progress” as a sign of either their immaturity and unintelligence, or their corruption by evil (because, of course, there’s only one way to be progressive, and that’s to be exactly like a country run by wealthy white men). His paternalism revealed itself in his not-entirely-honest reports to his superiors: he blamed the opposition to the American occupation on local leaders bent on exploiting the populace, as opposed to on a reaction to his use of military force to suppress indigenous communities. Despite the tenuous relationship Wood had with the peoples of the Philippines, his position as governor was deemed successful enough to promote him within a few years. He is the only doctor to have served as Army Chief of Staff. He returned to the Philippines as Governor-General in the ‘20s, where his rule was still resisted. His favoritism towards Americans caused at least one crisis: almost all of the Filipino cabinet members resigned after he reinstated a corrupt American cop. Wood died in 1927 from an unsuccessful brain surgery. Unfortunately, there’s no way to blame his contributions to America’s history of colonialism and racism on the brain tumor that led to his death.